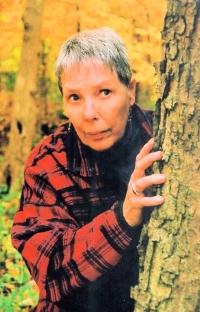 My guest today is S. M. Harding, author of twenty-four published short stories, photographer, and editor of Writing Murder, a collection of essays by Midwest crime and mystery authors. The handy primer on the art of crime fiction is based on a successful lecture program held at Jim Huang’s The Mystery Company. I’m a “seat of the pants” cook, always adjusting a recipe for my own taste. So please make what adjustments you will of what follows. My recipe for better writing begins with full cups of the three Ps: patience, persistence, and practice. Patience isn’t passive – it doesn’t mean sitting back and waiting for something wonderful to happen. Finished your first draft of a story or novel? Don’t fire it off to an agent or magazine; let it sit a bit on the back burner. Wait until it’s out of a fresh writing mind and cooled a bit. After you’ve left it awhile, go back with an editor’s eye. Look for spelling, grammar, syntactical errors; look for how well the story hangs together; look at setting, characters, suspense, dialogue, plot, and pacing. In the interim, look for a writing group, either locally or on-line. Take a writing course at a local college or find a writing workshop. Go to a conference. Join Sisters in Crime or Mystery Writers of America (there’s also organizations for writers who concentrate on thrillers, PIs, etc.) Find some good writing books like Writing Murder (OK, I’m biased, but this is the book I wish I’d had when I began writing fiction). Another I always recommend is Steering the Craft by Ursula K. LeGuin. The section on POV is worth the purchase price alone. Magazines like The Writer, Writer’s Digest, and Poets and Writers give craft tips that you can take back to your manuscript. Persistence means you keep writing, no matter what. Not everyone is going to like your plots, your characters, or your voice. Listen to what the rejection letters say, use those suggestions to improve your writing. Love what you’re writing enough to keep on, no matter what. And that includes what life hands us. Practice, practice, practice. Make time for your writing, do it every day. A great way to practice is the short story. Think of the investment of time in comparison to a novel! Writing in the short form also forces you to think about every word – if I don’t need it, out it goes. Short stories also makes you increase your plotting capability – crime and solution in 5,000 words, please. They also allow you to try out different characters, a different voice, or a familiar character in a completely different world. Short stories give you publishing cred – and may even result in a query from an agent (honest!). So, whatever the word that starts with “P,” the bottom line is write, learn to self-edit, get feedback from readers who write well. Then add big dollops of creative juices, a sense of achievement, and desire to get better. And above all, enjoy every moment! 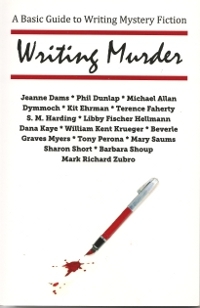 Purchase Writing Murder from the Indiana Writers Center.Purchase Writing Murder from Barnes & Noble. Purchase Writing Murder from Amazon.com. Great advice, S. M. and thank you for visiting. Anybody have any questions for her? A WRITING PROMPT FOR YOU: Look in the dictionary under the letter “P”. Pick a word at random and build a short story outline around it. This entry was posted in Writing. Tagged guest writer. Fun Was Had. Books Were Bought. To me, persistence is number one, and possibly the hardest to achieve. We live in a world of so many temptations and distractions that compete for our time. And sometimes, we just get tired. You know? But what’s the alternative? I’m a photographer, too, and I don’t want my work thrown out when I die! Same with my stories. So we keep on truckin’. Suzanne, thank you so much for visiting the blog and sharing your insights. I hope you’ll visit again! Marian Allen would love to share..Fun Was Had. Books Were Bought. Beverle, one also needs persistence to just keep on writing and submitting, or writing and self-publishing. There are so many obstacles and discouragements, so many other hopeful writers competing for readers’ attention. Now, more than ever, a writer has to love To Write. I agree with persistence being most important, but patience is crucial too. My recipe is write it, put it away for a while, then go back and edit after seasoning. Jacqueline, you are so right! Just after one has written something, it’s too easy to read it with what one MEANT TO SAY in mind. When one reads at a later point, the gaps and inconsistencies show. Humbling and instructive! The three Ps cover it all. I don’t think there are any overnight successes, just writers who kept on working year in and year in. Good post. There ARE overnight successes, but not enough to consider relevant. ANYTHING is possible in a quantum universe, but that doesn’t mean we should all jump off buildings because it’s marginally possible to land unharmed, right? Marian Allen would love to share..Dragonthology Is In Print!